I sit here to think of how to explain why I can’t post more often and I struggle with trying to sound gracious and humble. But it’s hard. My kids are absolutely a terror when it comes to picking up after themselves, causing more of a mess while I’m cleaning up the last mess and they do NOT like to get up out of bed in the morning. One child begs me to let her stay up later and read more and the other runs screaming through the house when he has to do 2 pages of homework (that would take him all of 3 minutes if he would just down and do it). I spent about an hour and a half last night doing the summer school homework with my son. Two little pages. 90 minutes. Several calm and thoughtful discussions in between about how we are going to be a team this month to get it done and a little bribery slipped into the mix. I soooo wanted to take my left hand and complete the homework for him, but I drew the line. Just a few more weeks and they are all play, all the time. Until then, we have a little extra work to get through to prepare for 2nd grade. So, anyway, the conflict I feel is to record in my memoirs this moment in time and to also be aware that others are reading this and I want you to know, gentle reader, that I am very blessed to have my family and I wouldn’t want any other family in this world. I love my children. I spoil them rotten I’m sure and my husband pulls more than his weight around the house. But we both work full time and that leaves precious little at night to feed everyone, bathe everyone, do homework and wind down enough to slip into an unconscious state. Now – for quilting pictures!! I would like to formally state that my official quilter is Linh at Lima Sews. She is fantastic and I was overly thrilled when I got my Nantucket back from her this past weekend. I gave a couple of design thoughts and asked her to ‘do her thing’. I’ll just pop these pictures in, back – to – back for your viewing enjoyment. I’m so glad that my backing allows the quilting to show off well. See what I mean about the backing? This is my favorite picture of the group. You see all the designs in one place. My only initial design request was circle feathers in the big stars. They turned out just like I wanted! Thank you Linh for a great quilt job! It is going to be so very hard to give this away – but at least it stays in the family. The binding needs to go on before Father’s Day, so I should be able to swing that at least. 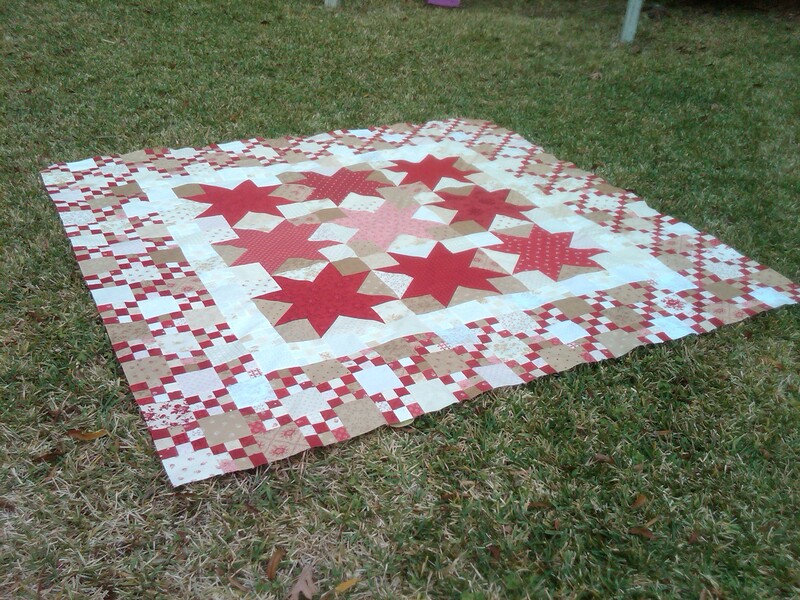 If you want Linh to quilt for you – you can visit her blog and website. Go to the bottom of her LiMa Sews site and you will see the SWOON quilt I did last year for a wedding gift in Happy Go Lucky fabrics. Thanks for visiting my site today. I hope to get back into a routine that will include more posts. 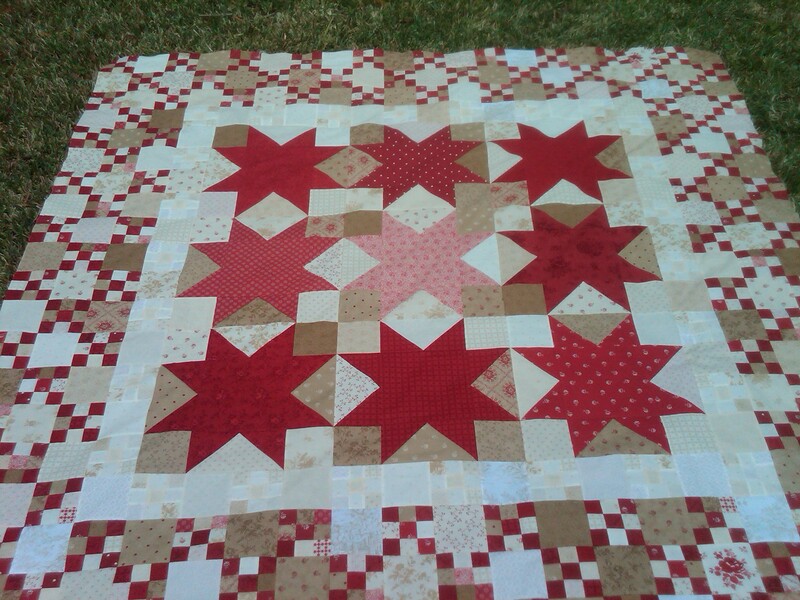 I am so very close to finishing my Great Granny Squared quilt. Just the plain outer borders left to sew and then a pieced backing. I told myself I wouldn’t post again until I got this quilt top done. Added the bottom border yesterday and snapped a few pictures before getting it all wrapped up for my Dad’s birthday gift. I didn’t have access to my husband’s phone, which has a much better lens on the camera. It looks like I have a ‘dream’ filter on mine. I present to you – NANTUCKET! LOVE this quilt! As I worked on the bottom border, I had to piece more 9 patch units due to the extra inner round of neutral border blocks. 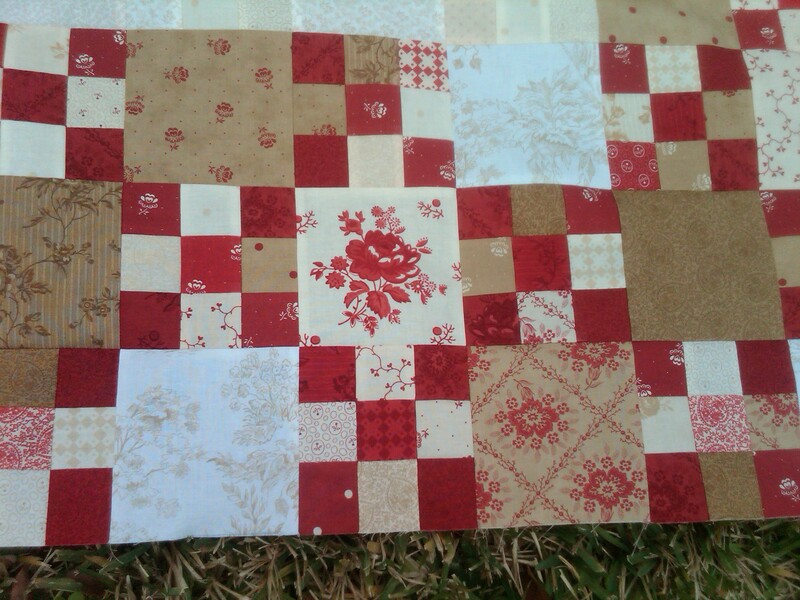 I had a charm pack and went through that for all the neutrals and tans for the alternating squares as well. In fact, I added a few neutral fabrics from my stash to get me to the end. A great cream/white toile print and a couple of shirtings from some manufacturer other than MODA (amazing that I can really, really tell a difference in the fabric. It was quite a bit thinner!). 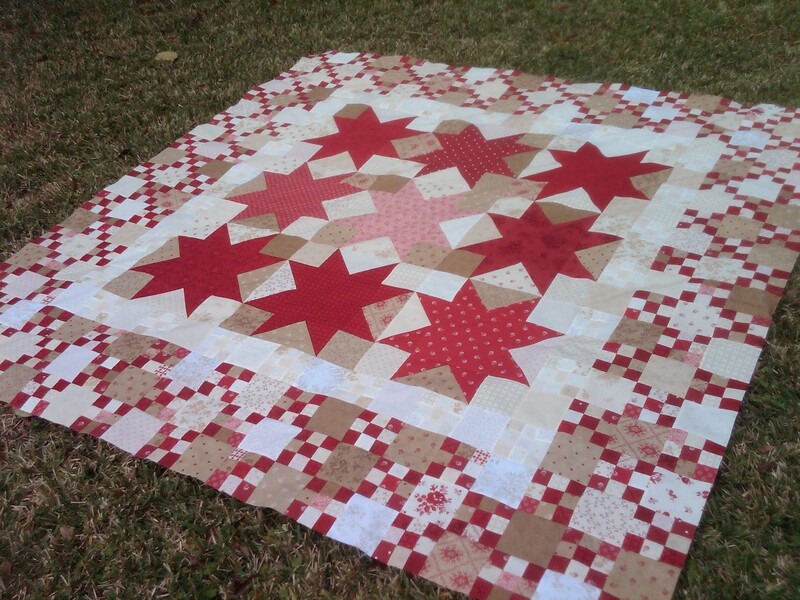 There were a few prints from the Midwinter Reds collection that I had held out of the quilt up to this time, because I felt they were too equally white/red and would muddy up the design. However, I love the few that ended up being scattered about. I did a fussy cut of this floral one and I love it!! Also, the print of the white ‘x’ on the red background (see the block just above the fussy cut flower) wasn’t used until the bottom border either. I have some yardage of that print and I plan to bind the quilt in it. I am so thoroughly happy that I did Nantucket, but I am soooo ready to move into a new project. After Christmas. I can’t wait to share with you in 2014! I hope the weekend is the start to a great holiday week for you, if you are celebrating for Christmas. My family will be traveling here, there and everywhere on many different days over the next two weeks. I hope to survive intact.